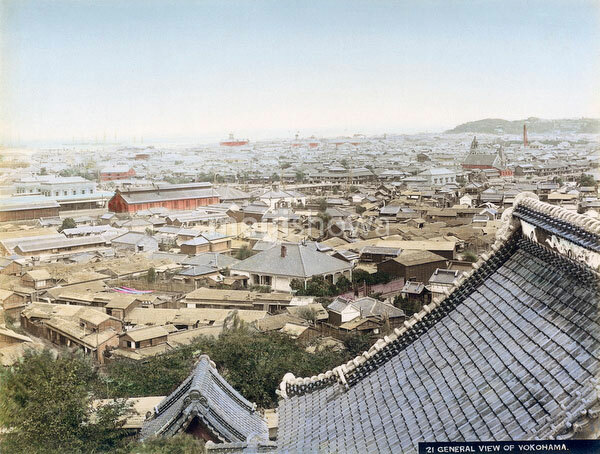 Panoramic view of Yokohama sometime in the 1890s as seen from Narita-san Enmei-in Temple. The twin buildings on the left are Yokohama Station, opened in 1871 (Meiji 4). The tower in right behind the roof of the temple is the Yokohama Shiloh Church (横浜指路教会), built in 1892 (Meiji 25). Compare this photo with 70507-0033 – View of Yokohama, shot from the same location around 1881 (Meiji 14).